The detailed glass features fleur-de-lis designs that mirror the ornament up top. 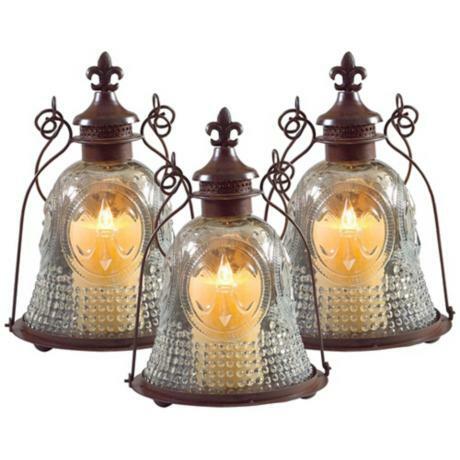 These vintage style fleur-de-lis lanterns are flea market chic! The intricate metalwork and decorative glass combine for an old world look that will enhance indoor and outdoor seating areas alike. Display pillar candles or groupings of votives inside. • Metal and glass construction. • Large lantern is 17" high, 11 1/2" wide. • Medium lantern is 12 1/2" high, 8" wide. • Small lantern is 9" high, 4 3/4" wide.